The Ministry of Health (MOH) will review the taking of informed consent by doctors as well as the Singapore Medical Council’s (SMC) disciplinary process, it said in a press release on Saturday (Mar 2). The Ministry of Education’s Sexuality Education (SEd) programme has drawn flak among some quarters after a picture of a consent form for the programme turned up online. Singapore needs to deepen relations with its ASEAN neighbours to correct the perception it is an arrogant nation that looks at developing nations with a condescending eye, said veteran opposition MP Low Thia Khiang (Aljunied GRC). While the Government will continue to plan and invest in infrastructure to ensure a secure, diversified and sustainable supply of water, Singaporeans must play their part and use water wisely, said President Halimah Yacob. Instead of focusing on the potential harms or benefits of vaping versus smoking in debates on e-cigarettes, we should look more closely at the industry’s preying on youth, say NUS Saw Swee Hock School of Public Health’s Dr Yvette van der Eijk and Dr Jeong Kyu Lee. AS co-living gains traction around the world, it is drawing attention not just from young people looking for an affordable, communal way of living, but also from investors eyeing its promises of stable returns and potential for growth amid rapid urbanisation. Lawyers representing several parties, including three Workers’ Party MPs, over $33.7 million in alleged improper payments, will meet in court again on April 9 and 10 to make their oral submissions. Both sides submitted their final replies to the High Court last Friday. China’s ambitious Greater Bay Area project encompassing Hong Kong, Macao and nine cities in Guangdong could threaten Singapore’s standing as a hub for finance and technology. SINGAPORE’S vision of “empathic and anticipatory” solutions to drive their digital economy hinges on the success of their Model Artificial Intelligence (AI) Governance Framework. Beyond mere policy-making, Minister-in-charge of Public Service Chan Chun Sing believes that there is a strong need to create a more diverse public service leadership and officers who have initiative and creative ideas, those who have strong inter-personal skills and work well with others. Singapore plans to buy an initial four F-35 fighter jets from Lockheed Martin Corp, with an option to purchase eight more, as it looks to replace its ageing F-16 fleet, the city-state’s defence minister said on Friday. Once upon a time, when I popped $0.80 into the vending machine, I got an ice-cold can of coke. Now, nothing costs $0.80 anymore and there are vending machines for stuff like freshly squeezed orange juice, fresh salads and even chilli crab. As the Singapore Police Force marks 70 years of women in policing, Channel NewsAsia speaks to two female officers who have earned their stripes. In one of the most anticipated announcement in parliament this month, Finance minister Heng Swee Keat delivered the Budget 2019 on 18 February. Most Singaporeans have digested the various policy announcements by now. Are you eligible to vote in the upcoming General Elections (GE)? BETTER get this checked quickly: If you’re above 21 years, are you eligible to vote in the upcoming General Elections (GE)? Good news: The registers of electors have been prepared and will be available for public inspection from Feb 26 to Mar 11, says the Elections Department. The Ministry of Health (MOH) will look into whether Community Health Assist Scheme (Chas) beneficiaries can be informed of their subsidy each time they use their card at a medical or dental clinic. A Singapore-flagged ferry ran aground at the Karang Galang reef, off the coast of Batam, on Saturday afternoon (Mar 2), the Maritime and Port Authority (MPA) said. Civil rights activist Jolovan Wham is being investigated by the police for protesting outside the State Courts without a valid permit on Dec 13, 2018, said the police on Saturday (March 2). A birthday celebration at a local coffeeshop turned sour when a disgruntled HDB resident allegedly threw a 10 KG iron plate that smashed into the brand new car of one of the party-goers. We must remain vigilant about threats to the region or risk of influence from foreign entities. An article was published yesterday about the recent accident at the Alexandra Central Mall where a lady was hit by a falling glass door in the mall, suffering multiple serious injuries, including head and liver injuries. Singaporeans get traditional when it comes to property. We want the land we pay for, and 99 years won’t cut it. We want our descendants holding on to it. Did you know a HDB loan doesn’t always cover 90 per cent of your flat price? Or that the interest rate isn’t really fixed the whole time? These are the details you’ll want. In the budget debate in Parliament today (1 Mar), Defence Minister Ng Eng Hen told Parliament that Singapore will be placing an initial order for four F-35 stealth fighter jets from the US. EXPECT active and passive funds that track the MSCI Emerging Market Index to gradually rebalance their asset allocation, market analysts have said. Foreign Minister Vivian Balakrishnan yesterday described the latest comments by Malaysian Prime Minister Mahathir Mohamad on the water issue as a red herring. Finance Minister Heng Swee Keat said on Thursday (28 February) that the Government has yet to decide the exact timing of when the planned Goods and Services Tax (GST) will be increased from 7 per cent to 9 per cent. Singapore’s monetary policy stance remains appropriate for current conditions and there is no need for policy stimulus if the economy performs as expected, central bank managing director Ravi Menon said. Not once but twice in one day Chan Chun Sing took the mickey out of Singaporeans. No conflict of interest, declared the Minister-in-Charge of the Civil Service last Thursday, on the appointment of the spouse of a political office holder as Auditor-General. TISG was satisfied with the clarification they got from NTUC Foodfare. The Singapore Army has made it mandatory for all high-risk and field training to be inspected for safety compliance, Senior Minister of State for Defence Heng Chee How said yesterday. Minister for Trade and Industry Chan Chun Sing confirmed that the Government is aware of the relationship between Singapore’s new Auditor-General Goh Soon Poh and her spouse, Senior Minister of State Heng Chee How, but asserted that there is no conflict of interest since Ms Goh is not a political office holder. CHINA’S purchasing managers’ index (PMI) contracted for a third straight month in February, two surveys show as the trade war with the United States persists. The chief executive officer of Singapore Pools, Mr Seah Chin Siong, has resigned from the organisation and will join the Singapore Institute of Management (SIM) in May. The end of the US-China trade war may throw up a surprise winner among Asia-Pacific currencies other than yuan: the Singapore dollar. Special Assistance Plan (SAP) students in secondary schools get $300 extra funding every year to develop their proficiency and interest in Chinese language-related studies. The Ministry of Health will be implementing an independent quality assurance review for every major system change following an IT error earlier this month, Senior Minister of State Edwin Tong said in Parliament on Friday (Mar 1). Raffles City Chongqing (RCCQ), CapitaLand’s mammoth mixed-use development in China, rises up from the landing point that had, 1,000 years ago, welcomed emperors visiting the once far-flung corner of the Chinese empire. The Ministry of Foreign Affairs (MFA) must establish itself as the authoritative source of information on Singapore’s foreign policy to mitigate the risks of Singaporeans being distracted, divided and deceived by fake news and online falsehoods, the ministry said. Mr Lui Hock Seng, who is now 83, first picked up a camera in the 1950s. But now, the Colourise.sg app allows for his black and white photos to be brought to life. Singapore may have accumulated an estimated surplus of $15 billion during the current term of government, but this does not indicate an upcoming spending spree. As of yesterday, operationally ready national servicemen (NSmen) no longer need to notify the authorities of overseas travel that is less than six months. A letter to parents about the Ministry of Education’s The Growing Years Programme, a sexuality education programme in schools, dated 13th Feb 2019 was shared on r/singapore. The market could continue to consolidate in the near term. Quarterly momentum has encountered resistance and turned down. 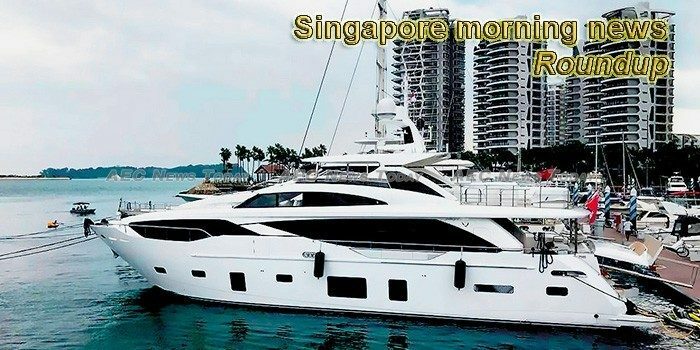 While the Government is aware of the relationship between Singapore’s new Auditor-General and her spouse, who is a Senior Minister of State, there is no conflict of interest at hand, as she is not a political office holder, said Minister of Trade and Industry Chan Chun Sing. The student supposedly did plenty of ‘random things’ during exchange. Changi General Hospital (CGH) says it has improved its records system, which was criticised by the apex court for causing a delay in the diagnosis of a cancer patient. The high profile and shall I say “popcorn inducing” trial between blogger Leong Sze Hian (Leong) and Prime Minister Lee Hsien Loong (PM Lee) has taken place.